TGIF… And here’s to this weekend being better than last! We planned to spend a super fun long Memorial Day weekend down in San Diego, but then Nick got sick with a stomach bug. It was not super fun. Not even a little bit fun. So it won’t take much for this weekend to be better! Since we always have an overabundance of quail eggs in our fridge, I figured I’d try to put some to use. 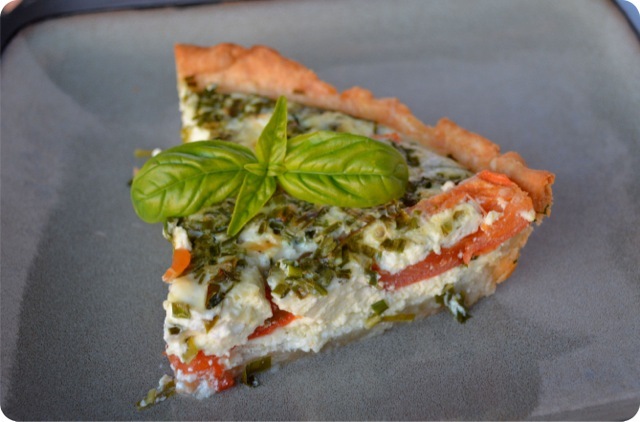 Ages ago, a friend sent me a favorite quiche recipe and it’s been sitting in my email ever since (seriously, since January 2013). It was high time I tried it out! The recipe below calls for normal eggs since, you know, not everyone has loads of quail eggs hanging around. But if you did really want to use quail eggs, you’d use 12 of them. Premade pie crusts are super convenient, but did you know you can make a homemade one almost as easily? And you most likely already have all the ingredients at home. Score! Combine all crust ingredients in a bowl and mix with a spoon until combine. Dump the dough onto a floured surface and roll into a circle big enough to fit your pie dish. Place into a nonstick-sprayed pie dish and trim off any extra edges. Spread the tomatoes out in the pie crust as evenly as possible. Combine the goat cheese, half & half and milk in a bowl and mash until the goat cheese it pretty well incorporated. Add the remaining ingredients and whisk until smooth. Pour the mixture into the pie crust over the tomatoes. Bake until the crust is golden brown and quiche is set, about 40-45 minutes. Let cool 10 minutes before cutting. This came out soooo yummy! I was actually really impressed with how well the pie crust turned out considering there was no butter or shortening in it. This was a great easy weeknight meal (it would also be a fabulous breakfast or brunch) and a good way to use up our quail eggs and garden chives & basil! Quiche is a favorite in our household but sometimes we go months without having one. I guess it is more special then when we finally do. The flavors in this one sound delicious. That is so cool you used quail eggs! They’re so tiny and cute. I like to break them open and pretend I’m a giant. Haha! This quiche sounds amazing! 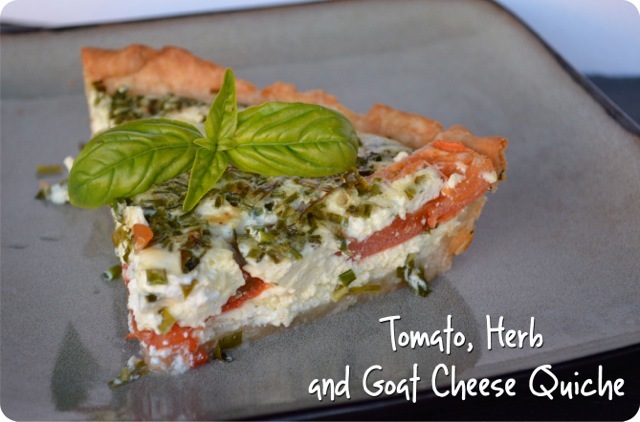 I love quiches, they are one of my favorite meals, but I have never tried goat cheese (or quail eggs), but your version sounds fantastic! Can’t wait to try it! They’re so easy!! And I love that you can change up the flavors to a million different varieties!